Blocks that are more complex and use small 2 inch squares and lots of scrap pieces…. blocks that I would love to see a quilt made out of but do not have the patience to make 20 or 30 of them for a whole quilt. These blocks are perfect for a quilting Bee because you share the quilting load… making two blocks each makes the quilt manageable. This block is called Scrap Jar Star and you can find the free pattern on A Little Bit Biased’s website. It was just what I needed to kick start my creativity this month. Not long after I wrote my last blog post a funny thing happened… I bumped my head. At the time it smarted and I felt a little weird but I continued on with my day. By that evening I knew that something was not right. I managed to hit my head in a strange place and a little harder than I thought and as a consequence I gave myself a severe concussion. Now this was not my first head injury… many years ago I managed to knock my head about quite badly in a car accident. My recent concussion, as a second injury, has been more severe and lasted longer. So for the last couple of weeks I have been struggling. For 10 days I did not watch or listen to anything…. that was hard slog and very very boring. I am still being treated under what is termed “concussion protocol”. It has taken me a couple of weeks to get my words back… it is easier for my to type than to speak, but both hurt. It really does seem as if the universe is conspiring against my efforts to blog… just saying…. Sick of being bored and feeling decidedly better, this week I dusted off the sewing machine and I started slowly trying to get back into it. I can not sew for too long and can not do anything to complex (my butterflies are currently on hold). Instead I grabbed my huge pile of mini charm squares (2 1/2 inch squares) and started playing. I found the pattern for this block on the Fat Quarter Shop site. They have a free pattern that you can print out called Sisters Choice… and you can find it here. 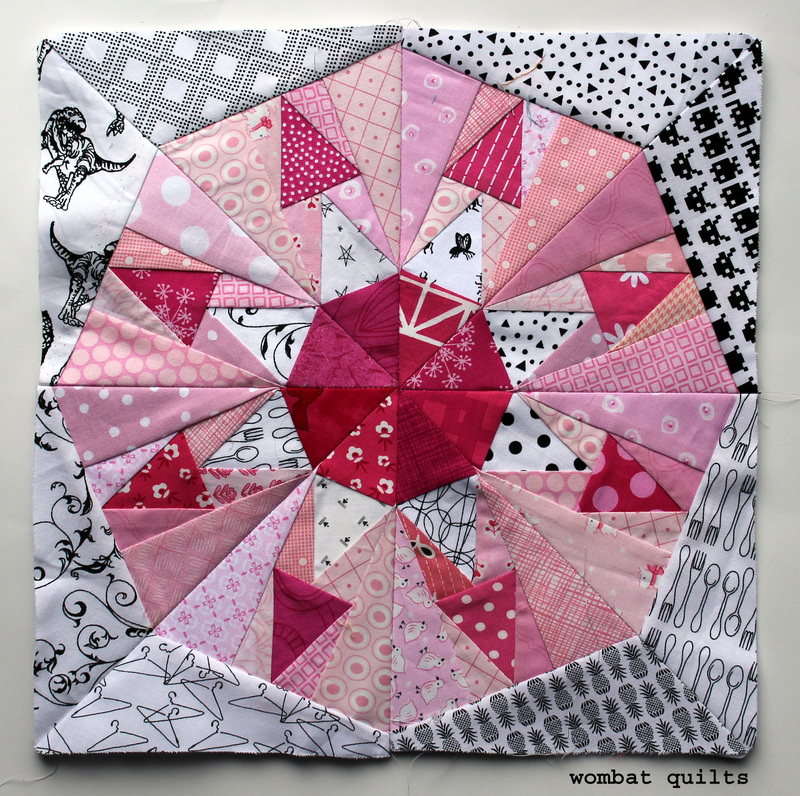 Their quilt is monochromatic and uses solids but it works just as well with prints and scraps I think. …messy and chaotic, a little like my brain…but slowly it will get better… less chaotic… more succinct… but it will always be full of colour. Welcome to what I think is my fifth time posting Paper Piecing Monday on a Wednesday. If you think how many PP Monday’s I have done 5 misses is not to bad…right! Anyhow I have another Hodge Podge block for you this week.. this time it a 6 inch version of the classic Centennial block…. I had fun using all the the little bits of yellow I had laying around (many left over from my Starry Night Quilt) but using just one colour does not really do this star justice, here is my favored alternative colouring…. A Rolling Square kind of day…. 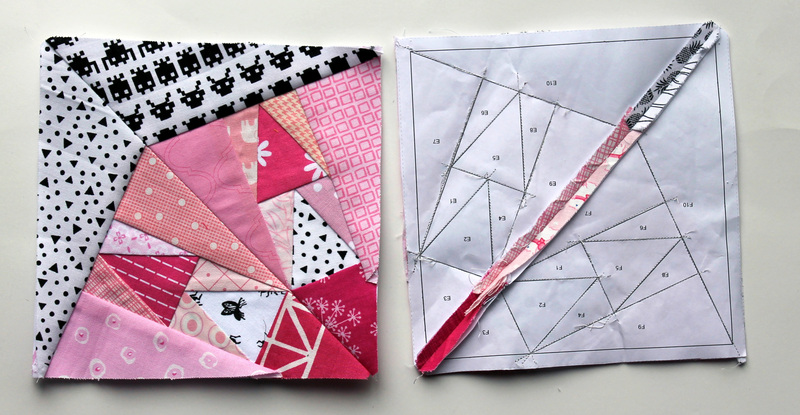 Welcome to the continuing saga that is Paper Piecing Monday…. I really did not know when I started this tradition it would last this long and produce so many patterns. This week I have another Hodge Podge block…and another Rolling block, this time the Rolling Square. This weeks Paper Piecing Monday block is the second in my snowball series…. I am loving the shape of these blocks and I must admit I may do more than I originally scheduled… this block is adapted from a pattern that came with my EQ program. It has quite a few little bits, and takes 80 fabric scraps to make! So if you would like to give it a try you can find the free PDF pattern here…Pink ball 2. Tune in next Monday for another pink snowball block, and another bad pun!